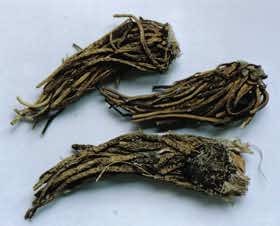 The drug is the dried root and rhizome of Veratrum stenophyllum Diels (family Liliaceae), growing in grasslands on mountain slopes, in scrubs, at the margins of woods, and distributed chiefly in the north west part of Yunnan, the west part of Sichuan of China. Pungent, bitter, cold, toxic; heart and kidney meridians entered. It is used to activate blood circulation and remove blood stasis, stop bleeding and relieve pain, induce vomiting and diuresis; for the treatment of traumatic injury, fracture, traumatic bleeding, rheumatic arthritis, epilepsy, paraplegia. It is made into powder, 0.03~0.06 g is taken each time, or soaked in wine. Proper dosage is for external application, pounded for applying. It is contraindicated using with Ren Shen, Dan Shen, Sha Shen, Dang Shen, Shao Yao, Xi Xin, Ku Shen and Xuan Shen.